Are Joe Mauer and C.C. Sabathia future Hall of Famers and how much money will Bryce Harper earn during free agency? These are the three individuals that we'll talk about in this story. Minnesota Twins first baseman and catcher Joe Mauer retired Friday after 15 seasons. He played his entire career with the same team which is uncommon these days. His career is refreshing because he played for his hometown team. Unfortunately for Mauer, his career was derailed by concussion issues. Mauer, 35, was drafted No.1 overall in 2001. He won an MVP in 2009, three batting titles, appeared in six All-Star Games, won five Silver Sluggers, three Gold Gloves as a catcher and had a career slash line----.306 average, 2,123 hits, 143 HR's, 428 doubles, 923 RBIs in 1,858 games. So the question remains is Mauer a future Hall of Famer? I'd say he's borderline because his numbers are good but are they enough to give him a plaque in Cooperstown, NY? The Baseball Writers Association of America could take his injury situation into consideration and if they ask what if he'd been healthy would his numbers be substantially higher? Mauer never had any off the field issues and I understand he was polite to the media. But what do you fans think? Please send me your comments and I'll mention them on The Sports Exchange (an Internet Radio Sport Talk Show http://www.weinetwork.com/) which runs Tuesday's and Thursdays from 5-7 pm. New York Yankees Pitcher C.C. Sabathia announced that he will retire after the 2019 season. During his 19th campaign, he'll earn $8 Million from the Yankees in what will be his 11th season playing in the Bronx. Sabathia's other stops include seven plus years with the Cleveland Indians and he was a rental for the Milwaukee Brewers in 2008. He won a Cy Young Award with the Indians. Sabathia currently has a lifetime record of 246-153 with a 3.70 ERA. He's the majors active leader in strikeouts with 2,986, walks 1,060, complete games 38 and innings pitched 3,470. There are some milestones he's looking to reach during the upcoming season. He's four wins away from 250. He's 30 innings away from 3,500. He's 14 strikeouts away from 3,000. He will be the 17th player to reach 3,000 strikeouts. Sabathia also has 12 shutouts and has won a World Series with the Yankees. What chance does Sabathia have to reach baseball immortality? In an age of specialization, I would say he has an excellent chance. Playing in the largest Media Market in the county referring to New York City will definitely enhance his chances considerably. Finally, where will Bryce Harper land in Free Agency? After turning down a 10-year contract worth $300 Million to stay with the Washington Nationals, the question remains which teams would be paying the potential asking price of up to $400 Million that Super Agent Scott Boras could potentially ask for? The only teams that I think could be possibilities would appear to be the Philadelphia Phillies, San Francisco Giants, New York Yankees or the LA Angels. I don't think the Chicago Cubs would ante up the coin since they snapped their 108 championship drought, thus there is no desperation to make a big splash of this kind. In fact, I see the Cubs ultimately cutting payroll to stay below the luxury tax threshold. Adding Harper to the Phillies would be an indication that Philadelphia is ready to win now and he'd sell a lot of tickets. The Giants have an excellent history and San Francisco has treated their superstar players well. They've even endorsed the pseudo Home Run King Barry Bonds, who hit his HR's with Performance Enhancing Drugs. It's hard to rule out the New York Yankees and pitchers would have nightmares if Harper was in the same line-up as Aaron Judge and Giancarlo Stanton. The LA Angels would be my dark horse if he's paired with Mike Trout in the lineup. If teams decided the asking price was too steep, and the market dried up, then I could see the Nationals bringing Harper back to Washington. Washington had a chance to land Yasiel Puig in a trade with the LA Dodgers but now it's inevitable they'll get nothing. It's important to note that Harper has never played in a full season nor has he won a playoff series. The most games Harper has played in a season is 159, at bats are 550, his career batting average is .279, has 184 HRs and 521 RBIs. Judge for yourself and let me know on the Sports Exchange. I wouldn't pony up that amount of coin based on seven years worth of work. Despite being 26-years old, that seems to be too high of a risk for me. Yet, there is always an owner that would take on such an investment. He's a member of Detroit Sports Media and is host of the Sports Exchange which can be heard on weinetwork.com. 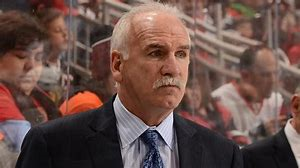 In the NHL, the Chicago Blackhawks fired their 60-year old head coach Joel Quenneville, a native of Windsor, Ontario, Canada. Quenneville coached the Windy City squad for 10 seasons and won three Stanley Cups. At the time of his dismissal, Quenneville was 6-6-3, but was 3-6-1 in their last 10 games, two points out of the Wild Card Spot in the Western Conference. He was replaced by 33-year old Jeremy Collins, who is now the youngest coach in the NHL. Quenneville turned the Blackhawks into a dynasty after being hired in 2008, winning the three titles from 2010-2015. He won three Central Division Titles along with a Presidents Trophy in 2013. His overall mark for Chicago was 446-243-93. But don't feel sorry for Joel because he can still feed his family. He signed a three-year contract extension in 2016. He's owed the remainder of this years salary and will pocket another $6 Million next season. In 1,636 games coached, he's won 890, lost 532, has 77 ties and 137 overtime losses. There is no doubt that he can afford to be patient and selective of his next opportunity as his services will be in high demand. Now we turn our attention to the North Side of Chicago where the Cubs reside. Manager Joe Maddon has one-year left on his contract that runs through the end of 2019. President of Baseball Operations Theo Epstein has tabled talks for an extension until late next season or afterwards. The 64-year old skipper has guided the Cubs to a combined 387-261 mark, been to the playoffs all four years he's been at the helm and famously ended a 108-year World Series Drought. He won The Fall Classic in 2016, his second year with the team. The 2018 Wild Card Game loss to the Colorado Rockies last month marked the Cubs shortest post-season stint in Maddon's tenure. I'll be curious over the course of the next year as to what roster moves are made and will the Cubs cut down on payroll, thus determining what talent he'll have to work with. To Maddon's credit, if he can win with the low-budget Tampa Bay Rays, he can succeed anywhere under any circumstances. If he ever becomes unemployed, he won't be out of work long. Finally, the next championship pink slip comes from North Of The Border in the Canadian Football League. The CFL's Toronto Argonauts fired head coach Marc Trestman---one year after a Grey Cup victory. Trestman was hired as the Argonauts 43rd head coach in February of 2017 and went on to lead them to a thrilling 27-24 victory over the Calgary Stampeders in the 105th Grey Cup in Ottawa after a 9-9 regular season. The 2018 season saw Toronto slide to 4-14 and the 62-year old Minneapolis, MN., native is out of work. In the CFL, Trestman won two Grey Cups with Montreal and another with Toronto giving him three. I'll be curious where Trestman will land next, North or South of The Border. Scott Morganroth can be reached at www.scottsports33.com and is a member of Detroit Sports Media. He is also the Host for the Sports Exchange on weinetwork.com. If you're looking for a weekend getaway in the sun and get away from the cooler weather in Metro Detroit, this was the time to schedule it. On Saturday Night October 20, 2018, the Detroit Red Wings traveled to Sunrise, FL to face the Florida Panthers at 7 pm. Sunday afternoon at Hard Rock Stadium at 1 pm, the Detroit Lions made it's every eight-year visit to face the Miami Dolphins. This past spring, there was a similar situation which took place. The Detroit Pistons faced the Miami Heat on a Saturday Night, while the Tigers played the Washington Nationals in West Palm Beach on Sunday. Due to medical issues, I was limited to one contest and elected to see the Tigers game. This would be the latest Spring Training venue that we saw and that stadium was dynamite. The common denominator with all these games is that it's nice to be able to sleep in my own bed during these occasions. The Red Wings entered their contest with the Florida Panthers as the only winless team in the NHL with a 0-5-2 mark with two points. Detroit was playing a Panthers club that was also struggling with a 1-2-2 record with four points. The Red Wings always seem to play well at the BB&T Center. Detroit's record against the Panthers was 7-10-2-4. There was no shortages of chants that said "Let's Go Red Wings." As we were leaving the game, I saw a Red Wings fan wear a Harold Snepsts white jersey. How many millennials remember this guy? But Detroit woke up in the second period scoring three unanswered goals to take a 3-2 lead. Florida would score a later goal in the third period to tie the game at 3-3, but Detroit and goaltender Jimmy Howard showed resilience in overtime to come away with a 4-3 triumph. As I went down to the Red Wings locker room, I saw GM Ken Holland, and he was the most relieved man in the building when I asked him how it felt to get that first win. When the game was over, I spoke with Dennis Cholowski, who was playing in this arena for the first time, about his thoughts about playing in front of the Metro Detroit transplants. "It's pretty darn cool and we have a loyal fan base," Cholowski said. "They follow us everywhere through thick and thin. So it's pretty cool to see that." Cholowski said he was relieved to see the team get that first win out of the way. "For sure, we were yearning for it and we've wanted it for awhile now. Thankfully, we got the first one out of the way." Coach Jeff Blashill said getting a win anywhere would have been important but also chimed in on Detroit's home away from home. "We're fortunate we got lots of Red Wings fans throughout the country," Blashill said. "Certainly, whenever we come here there is a good number of red and white so that's a great thing. We play pretty good in this building and I thought certainly parts of tonight was real good." Through the years, I've covered the Lions many times on the road. But the place which is No.1 on my list is when they face the Miami Dolphins. When I first became a sports writer, the Miami Dolphins were the first team that I covered working with the legendary Don Shula. Because I was young, I was a bit intimidated by him. But as I worked with him often, he used to joke around with me and I used to ask for words of wisdom, which he was great about giving me. I covered the Dolphins when they played at the now demolished Orange Bowl. I interviewed late Owner Joe Robbie, who built the current stadium which I've seen two Super Bowls along with Lions and Miami Hurricanes games. I also saw a game when Nick Saban was the Dolphins coach and former Lions QB Joey Harrington faced the Green Bay Packers and legend Brett Favre. Too many memories to document. This brings us back to the South Florida/Detroit Showdown Weekend. The Lions entered the Dolphins game with a 2-3 mark, while Miami is looking for its first 5-2 start since 2003. The Dolphins are 5-2 in their past seven meeting with the Lions, but Detroit has won each of the past two, including a 34-27 win in the last meeting in South Florida on December 26, 2010. Today's intrigue would focus on whether Lions Coach Matt Patricia, formerly of the New England Patriots, could use his divisional knowledge to gain a scouting advantage of the Dolphins enabling Detroit to climb to 3-3. One area Patricia won't have as much knowledge about is Dolphins QB Brock Osweiler, as he will start instead of signal caller Ryan Tannehill, who is sidelined due to a shoulder injury. On this day, Lions would defeat the Dolphins 32-21. The Lions scored a touchdown on their first possession for the first time this season while snapping Miami's streak of 13 consecutive games without allowing an opening drive touchdown. Detroit recorded 248 rushing yards as a team, the most since logging 249 yards vs Indianapolis on November 23, 1997. Rookie running back Kerryon Johnson finished the day in career highs with 19 attempts for 158 yards (8.3 avg.). He added two receptions for 21 yards to finish with a career-most 179 yards from scrimmage. One of his runs was a 71-yard rush in the second quarter. QB Matthew Stafford finished the day 18-of-22 passing for 217 yards and two touchdowns, good for a passer rating of 138.1. The Lions left South Beach feeling good about themselves by improving their record to 3-3. But how indeed the fortunes have changed for both squads. After the Red Wings left South Florida they went on a two-game losing streak. But in their last 10 games, Detroit is 7-3 and through 17 games, the Red Wings have improved their record to 7-8-2 with 16 points. As for the Lions, they've lost three consecutive contests and are 3-6, as they reside in last place in the NFC North Division. With their playoff hopes diminishing and a lost season, Coach Patricia finds himself with a lot of work to do to gain the confidence of a fan base that believes his hiring was a huge mistake. Nonetheless, if you're a Detroit Sports Fan, who was in South Florida for the weekend, going 2-0 was money well spent. Scott Morganroth can be reached at www.scottsports33.com. He's a member of Detroit Sports Media and also hosts The Sports Exchange on the weinetwork.com.